My husband can’t sit down at an Italian restaurant without ordering Spaghetti and Meatballs. It could be the finest Italian restaurant with a menu dripping in tempting options and all he wants is Spaghetti and Meatballs, preferably with garlic bread. It’s truly one of his favorite meals and he craves it the way that I crave a good piece of dark chocolate or wedge of brie with baguette. So, when I decided to make this simple, classic dish for dinner yesterday, I knew he’d be thrilled. My timing was impeccable. By the time my husband walked through the door, the sauce had been simmering away on the stove for three hours. The meatballs had been baked and added to the sauce. The garlic bread had been prepared. Our house was bursting with the warm, delicious aromas of tomatoes, garlic, and olive oil. Upon stepping into the house, out of the chilly autumn air, my husband took one breath before his eyes lit with joy. What are you cooking? I told him to take a guess. Spaghetti and Meatballs??? His reply was dripping with eager anticipation. I nodded. And garlic bread?? Yes, of course. And I could see him physically buzzing with excitement. Such joy from such a simple meal. And in that moment, as he stood there, still removing his jacket and shoes, with a child-like grin on his face, it occurred to me that I could profit from this glee. Maybe I should ask for something. Perhaps those fuzzy winter boots I’ve had my eye on. Or a Mercedes E320! No, no! A pony! I’ve always wanted a pony. Yes, that’s what I would ask for. Then, as fast as it arrived, the moment was gone. The kids began climbing his legs while the dog anxiously communicated his desire for a walk in his typical brutish manner. So, no pony for me. Though, my husband’s evident joy was sufficient reward. During the hot summer months, when tomatoes have reached their glorious peak of flavor perfection, it would be a pity to use canned tomatoes in your sauce. 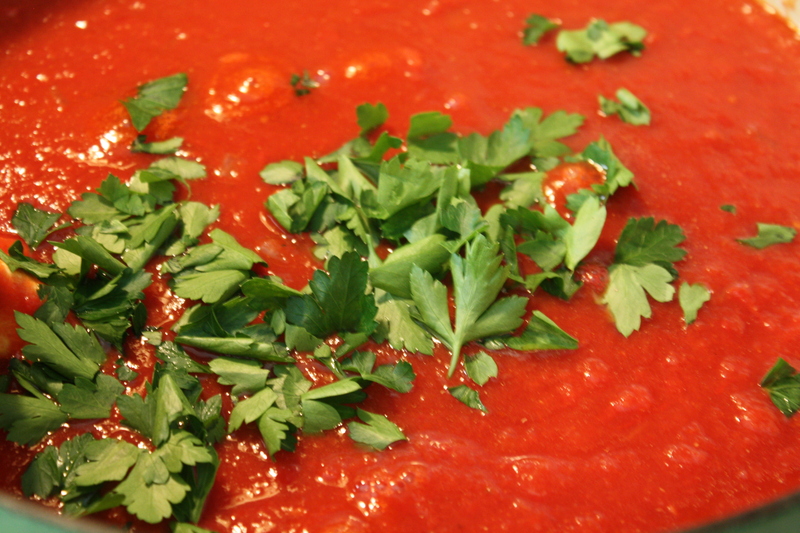 (Click here for my Fresh Tomato Marinara Sauce recipe.) But, right about now, when tomatoes have become mealy and bland, you’d be silly to use anything other than canned tomatoes. Most canned veggies have a justifiably bad rep for being loaded with salt and drained of their nutrition. But, tomatoes may be one of the rare exceptions. I actually read an article once, which claimed that tomatoes may actually benefit in both flavor and nutrition (lycopene content) from the canning process. Just look for tomatoes which don’t contain extra sodium. 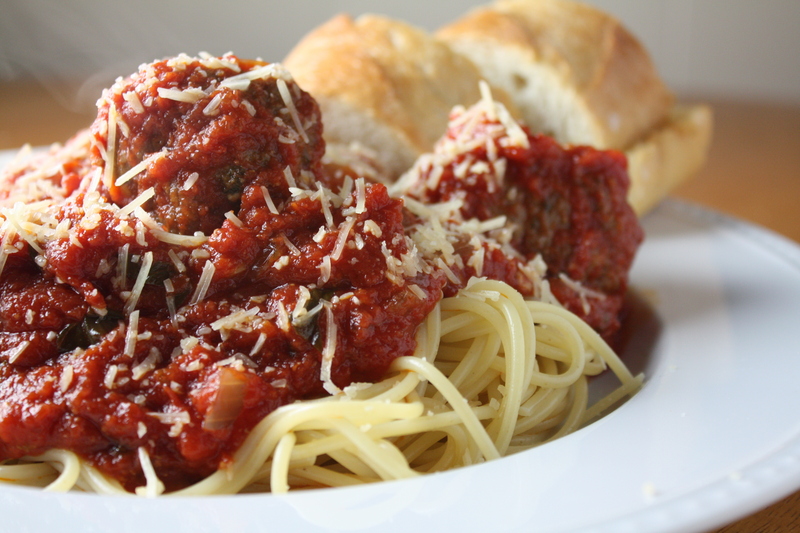 Both my sauce and meatball recipes are simple, classic preparations. No fancy ingredients or interesting twists. Just basic, delicious spaghetti and meatballs, cooked the way I remember from my childhood. The sauce is slow cooked for about 3 hours to allow a rich tomato flavor to develop. Onions, garlic, basil, parsley, and crushed red pepper provide just the right amount of seasoning. The meatballs are basic beef meatballs, blended with a bit of cheese and a few seasonings, then bound together with an egg and a touch of bread crumbs. 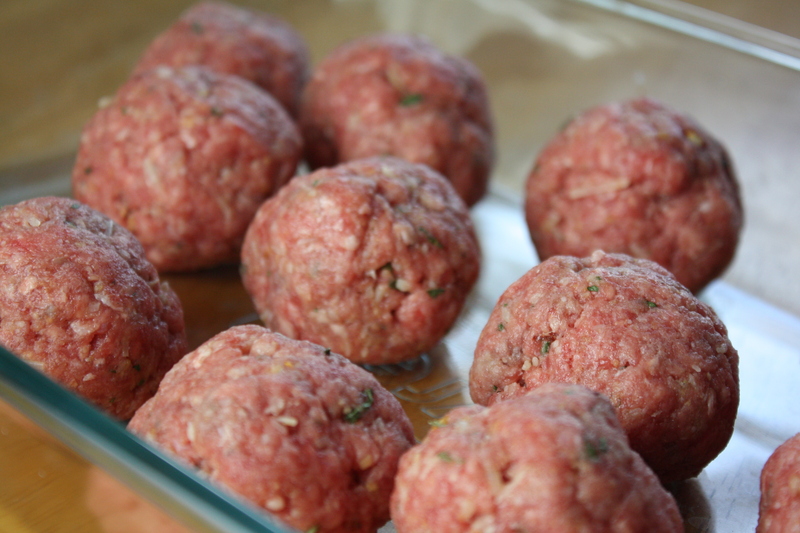 You can use any type of ground beef or other ground meats in your meatballs, but as with hamburgers, the higher the fat content of the meat, the juicier and moister the resulting meatball will be. Heat olive oil in a large saucepan or Dutch oven over medium heat. Add the chopped onion and smashed garlic cloves. Cook for a few minutes until the onions are tender and translucent. Pour in the crushed tomatoes and tomato paste. Fill the tomato paste can with water and add to the saucepan. Stir in the fresh parsley leaves, basil, and bay leaves. Cook over low heat, partially covered, for about three hours, stirring occasionally. Taste and season with crushed red pepper and salt, as desired. 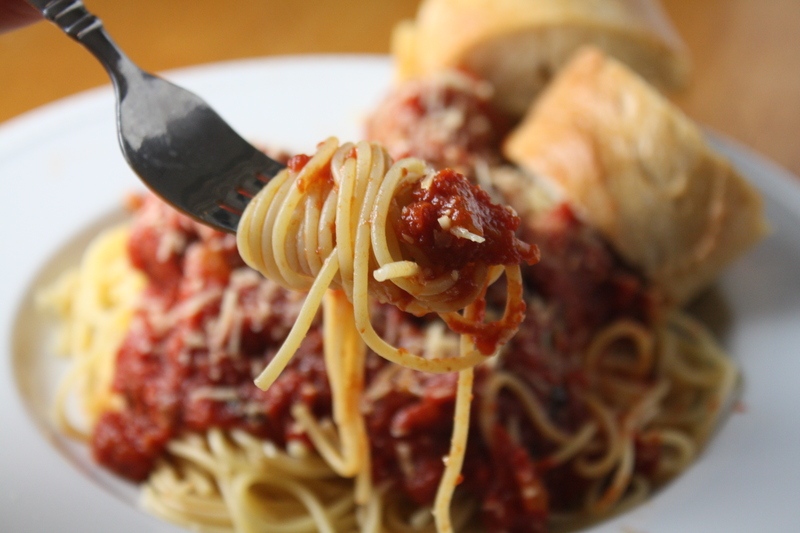 *This recipe makes a great big batch of sauce, perfect for leftovers or freezing! Preheat oven to 400 degrees. Place all ingredients in a bowl. 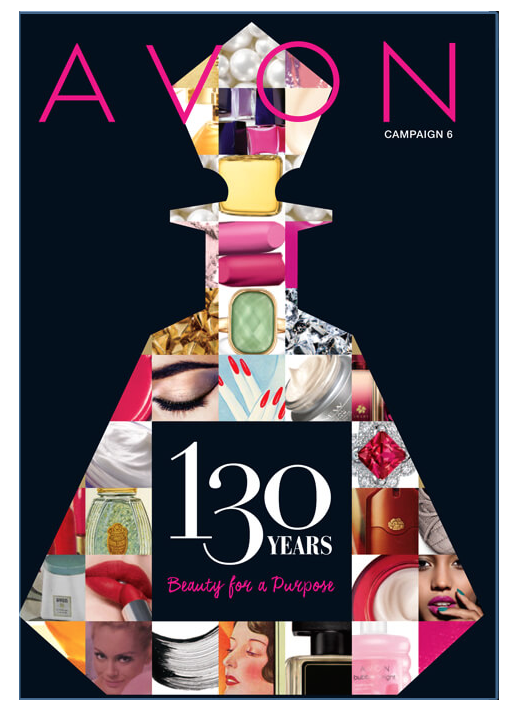 Use your hands to blend, until all ingredients are evenly combined. 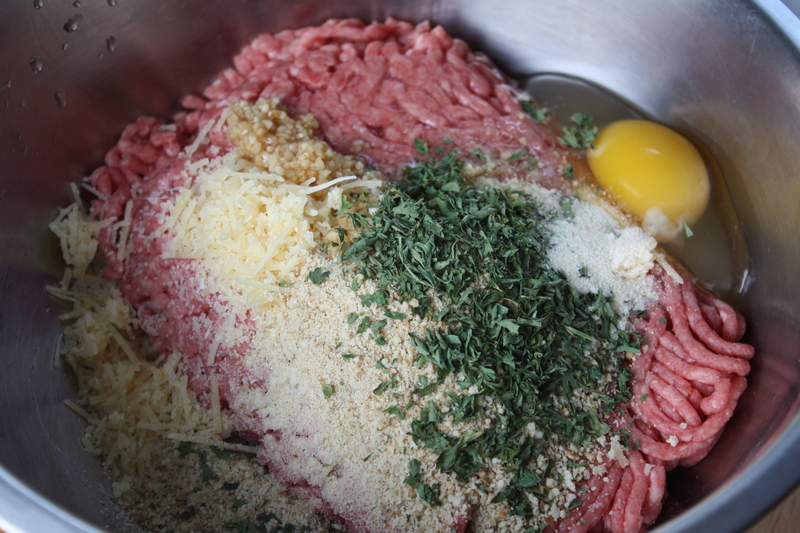 Using your hands, roll 12-15 meatballs with about 1 1/2″ diameter each. Place the meatballs in a baking dish and bake for 20-25 minutes until fully cooked. Set aside or add to the sauce as it cooks. Posted in Beef, Food, Main Course, Recipes, Sauces, Side Dishes and tagged beef, Cooking, Eating, Food, food photography, italian food, meatballs, pasta, Recipes, sauce, spaghetti. Bookmark the permalink. Well done on making your husband’s favourite meal! I take great pleasure in watching my husband eat one of his favourite meals – makes me all warm and fuzzy. I love homemade meatballs! There is nothing better than this meal in my house…it’s so comforting, especially as the weather is finally getting cooler. made this today – I’ll be making it again. The whole family loved it. My boyfriend is typically the chef in our household, but since I had a week off from work, I volunteered to make one meal during the week, completely from scratch. I followed your recipe for the sauce and the meatballs and everything came out wonderful!! My boyfriend was SO impressed… so thanks for the recipe!! Yippee for wowing the boyfriend!! Thanks for your comments!